If you could choose an Old China Hand life to live (or even just borrow for a long weekend), whose would it be? Botanist Robert Fortune exploring the interior in disguise and smuggling tea plants out of the country; archeologist Aurel Stein uncovering treasures from the lost desert settlements of the Silk Road; literary degenerate Edmund Backhouse forging Chinese manuscripts? Perhaps journalist Edgar Snow visiting Mao in Yan’an for his “scoop of the century” or aviator Claire Chennault leading the Flying Tigers? You could do much worse than choose Englishman William Mesny. “William who?” you ask. 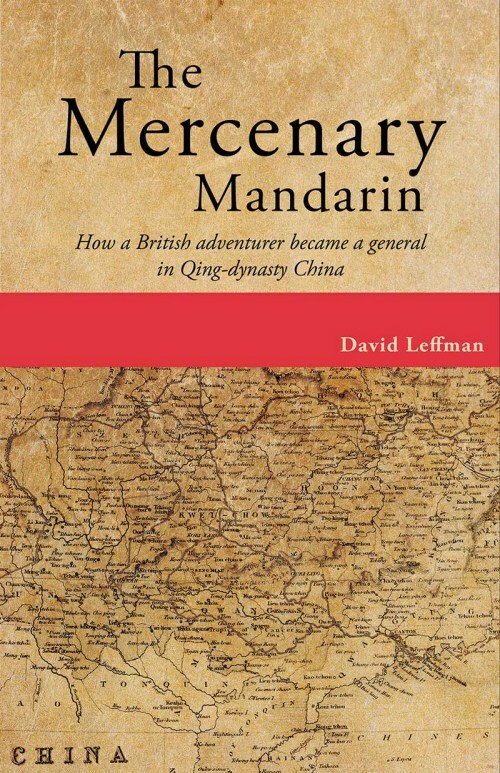 I hadn’t heard of him either until coming across David Leffman’s outstanding The Mercenary Mandarin: How a British adventurer became a general in Qing-dynasty China. Mesny was born in the Channel Islands in 1842 to a poor family, and went to sea at the age of twelve. His China adventures started in 1860, after jumping ship in Shanghai. Over the ensuing six decades, he forged himself an astonishingly varied résumé; at various times he was a weapons smuggler, a prisoner of war, a customs official, an advisor to influential governors, a military instructor, an explorer, and a writer. He started as a blockade-runner on the Yangtze River during the last years of the Taiping Rebellion (1850–1864), taking guns and other necessities to the Taiping rebels (or whoever was paying). The Taiping Rebellion was an immensely bloody conflict – responsible for a total of approximately twenty million deaths – and it threatened the very existence of the Qing dynasty. At first, the Western powers sat on the sidelines; though the Taipings elicited some sympathy for being pseudo-Christians (their leader claimed to be the younger brother of Jesus Christ), they were just a little bit too crazy (and their proto-communist ideas about abolishing private property and trade were anathema to Western commercial interests). Eventually, the Western powers sided with the status quo of the ruling Qing dynasty. For Mesny, this resulted in capture by the Taipings and being held as a bargaining chip. Five months into his captivity, Mesny managed to smuggle letters out of Nanjing and before long a British gunboat appeared demanding his release. Mesny held no malice towards his former captors. They had treated him well and he’d been on friendly terms with them. Indeed, he felt so much goodwill that he turned down a lucrative job offer to be a drill instructor to the Imperial troops. Although the Taipings were finally defeated in 1864, rebellions continued to rage across China, and Mesny found employment as a military instructor in the southwestern province of Guizhou helping put down the Miao Rebellion. Mesny’s war service earned him a new post in 1871, Provincial Superintendent of Foreign Arms, at the attractive provincial capital of Guiyang. The following year saw a return to the field fighting Muslim Hui insurgents in the southwest, for which Mesny – just thirty years of age – was promoted to the rank of major-general. In 1877 Mesny traveled with explorer Captain William Gill on an extended journey through southwestern China in search of a trade route from British India into the promised land of China’s interior and its largely untapped markets. Mesny went on to explore many of China’s frontier lands, gaining a rare depth and breath of knowledge of the country. One long trip took him from southeast China all the way to Hami in what is today Xinjiang, where he was aiming to arrange loans and arms purchases in advance of expected trouble with the Russians. This is classic Mesny: intrepid, curious, overly optimistic and/or unlucky. The deal – if indeed there had ever been a realistic chance of it coming off – fell through. Mesny, however, always had a next project to work on, and he made the long overland journey to Peking brimming with ideas. On his wanderings through China’s vast interior he had seen great potential and he was determined to help realize it with modernization and development. In terms of Zhang Zhidong’s career it’s worth noting the timing of Mesny’s manifesto, delivered in a backwards province to an obscure, inexperienced governor who, up to this point, was known only for an outspoken nationalist. Within a decade Zhang would burst out of rustication to become a driving force behind the “Self-Strengthening Movement” which swept China in the late nineteenth century; a man who employed over two hundred foreign advisors on his staff, built China’s first modern mint at Guangzhou, instigated the country’s first long-distance railway and founded China’s first major industrial project, the Hanyang Iron and Steel works at Wuhan. It’s credible, therefore, that Mesny’s proposal at Taiyuan – or at the very least, Mesny’s fervent conviction that modernisation was essential to China’s future – actually influenced the course of Chinese history. However, Mesny’s star did not rise with Zhang’s. He suffered various failures and scandals, losing money, prestige, and government employment. With his waning fortunes, Mesny turned to a massive writing project. Starting in 1895, he began publishing a magazine called Mesny’s Chinese Miscellany: A Text Book of Notes on China and the Chinese. As the title suggests, Mesny’s Chinese Miscellany was an eclectic mix of information about China, personal reminisces and opinions. Released over the following decade, the magazines were later combined into four volumes of about five hundred pages each. William Mesny and his biographer, British travel guidebook writer David Leffman, are linked across the years by their determined wanderlust and wide explorations of China. Leffman came upon the Mesny story at the turn of the century while doing fieldwork to update a Rough Guides book. From inspiration to finished book would take fifteen years’ of research and legwork. Leffman had first visited in China in 1985, just as the country was gradually opening up to independent travellers. Those were the days when many areas were off-limits, buying train tickets involved hours of persistence, and nearly every question was answered with a meiyou, bu zhidao or mei banfa (all variations of “no”). I have never left another country with such an overwhelming sense of relief as I left China in 1985, almost running onto the plane and swearing I would never, ever, ever return. Yet like many people, I found that China had wormed its way under my skin. The Mercenary Mandarin is a book I wish I’d written. Mesny’s story is pretty much the perfect subject. First, the man himself is likeable – he seems to have been friendly, honest, brave, and unprejudiced. His flaws – among them holding grudges, gluttony, and the inability to focus on a single project – are minor ones. Secondly, he was at the heart of important historical events yet also involved in lesser known episodes such as the Miao Rebellion. And whereas many biographies of treaty port days center on Peking and Shanghai, much of Mesny’s story plays out in places we’re not so familiar with: the treaty port of Hankow, the little known province of Guizhou, and China’s frontier areas. Likewise, his career was varied and unique, spanning military, government and business spheres. David Leffman writes about Mesny with insight, warmth, and modesty. Despite retracing so much of Mesny’s life on the ground and in the archives, the author largely keeps himself out of the story. This is not an “in the footsteps of” book, nor a historian’s procedural overly in love with the chase. The Mercenary Mandarin is more than just a well-written biography of a fascinating life; it’s also a panoramic look at the last half-century of Qing-dynasty China and an uplifting reminder that there are still big untold stories out there awaiting discovery. If you live in Asia, make sure to buy the book directly from Blacksmith Books as shipping (airmail and registered) is free. It will also be available from Amazon.co.uk in September and Amazon.com in November. For more information about David Leffman and his writing, visit his website. Although the book is illustrated with maps and photos, it’s well worth looking at the author’s Mercenary Mandarin Facebook page. You’ll find countless photographs, research notes and other material that didn’t make it into the book.